The natural cooling of the coin after Minting as a lot of heat is generated in the Minting/Stamping process. · Man made due to cleaning. I am 100% sure that when the coin comes back from say a NGC grading with "surface hairlines" it refers to "man-made due to cleaning"
I only became aware of "machine-made" hairlines a relative short while ago: - for the untrained eye there is no difference, but the moment you become aware of it, it almost pokes you in the eye. but then I collect for fun and not for resale. Thanks for your input Pierre. In my mind, being an engineer, when I read hairlines my mind automatically registers hairline cracks...which occur naturally when a "body" is under load or heat stress! Instead of hairlines why don't they state scratches....this is very confusing to me....the term scratches logically (to me) makes more sense! Hairlines are a natural occurrence caused by external forces and scratches are made by a direct mechanical means! Less experienced collectors may confuse mint-made die polishing marks for hairlines. Die polish lines are raised on the coin’s surface. Hairline scratches on a coin go down into its surface. This difference may be difficult to see at first. Obviously, if a collector does not detect the hairlines on a coin or mistakes them for die polish, he might be tempted to remove it from a slab to send it in for a higher grade. This can be a quick grading lesson when the coin is returned with its original grade. A few years ago NGC would have rejected a coin that appeared cleaned (i.e. returned it unslabbed with a note) and NCS mostly only stated "improperly cleaned" on the slab. NGC then started putting "problem" coins in a slab indicating a bit more details (where apparent) on the probable type of cleaning. One of these being "SURFACE HAIRLINES". 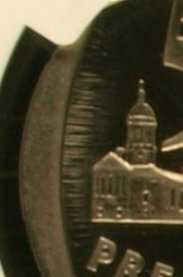 The correct term (probably shortened by NGC) should be "surface hairline scratches" as these surface hairlines is actually a multitude of fine scratches on a coin's surface, after minting. through addition of the terms LIGHT, MODERATE or EXCESSIVE." An example of hairlines caused by the forces in the minting process can be seen on attached Inauguration R5 coin. These hairlines however does not result in a "details grade" as this is caused by the minting process. This specific coin have a grade of PF69UC. I might be wrong, but it seems to me that these "stretch" marks are more common on the R1 and R5 coins, and not so much on the R2, and never on the other denominations with different type metals. I think you are right when you say the marks are caused by the forces of the process, rather than die marks. I also got a feeling that the marks are valleys rather than ridges. This might help Alloway with his heat/friction/cracks observation during the minting process. I think we have all learned something about surface hairlines on coins...I must now have a closer look at some of my ungraded coins.